Addressing the Victorian obsession with the sordid materiality of modern life, this book studies dirt in nineteenth-century English literature and the Victorian cultural imagination. Dirt litters Victorian writing – industrial novels, literature about the city, slum fiction, bluebooks, and the reports of sanitary reformers. It seems to be "matter out of place," challenging traditional concepts of art and disregarding the concern with hygiene, deodorization, and purification at the center of the "civilizing process." 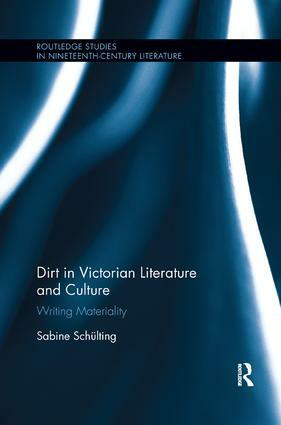 Drawing upon Material Cultural Studies for an analysis of the complex relationships between dirt and textuality, the study adds a new perspective to scholarship on both the Victorian sanitation movement and Victorian fiction. The chapters focus on Victorian commodity culture as a backdrop to narratives about refuse and rubbish; on the impact of waste and ordure on life stories; on the production and circulation of affective responses to filthin realist novels and slum travelogues; and on the function of dirt for both colonial discourse and its deconstruction in postcolonial writing. They address questions as to how texts about dirt create the effect of materiality, how dirt constructs or deconstructs meaning, and how the project of writing dirt attempts to contain its excessive materiality. Schülting discusses representations of dirt in a variety of texts by Charles Dickens, E. M. Forster, Elizabeth Gaskell, George Gissing, James Greenwood, Henry James, Charles Kingsley, Henry Mayhew, George Moore, Arthur Morrison, and others. In addition, she offers a sustained analysis of the impact of dirt on writing strategies and genre conventions, and pays particular attention to those moments when dirt is recycled and becomes the source of literary creation. Sabine Schülting teaches at Freie Universität Berlin, Germany. Her research focuses on early modern and Victorian literature and culture. Recent book publications include Shylock nach dem Holocaust and Early Modern Encounters with the Islamic East. She is also the general editor of Shakespeare Jahrbuch.